It happens to the best of us. No matter how much we plan prior to packing for a trip, something inevitably gets left at home. But it’s not a problem; you’ll just grab a replacement at the airport, right? You might want to hold off on that. With little competition once you’re past security, airport vendors can increase their prices which can negatively affect your travel budget. 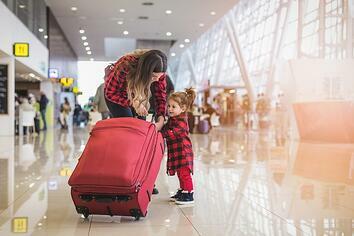 Here are a list of items that you should avoid buying at the airport. While a book can be a great way to pass the time on a flight, try and pick up a book before getting to the airport. Libraries also have great options for e-books that can be borrowed instantly, if you already have a membership, and then returned once you flight finishes. This can save you from having to spend money at the airport and library late fees. While it’s important to stay hydrated while traveling, skip the airport shops. Instead of buying something to drink, bring an empty, reusable glass or aluminum water bottle and fill it at a water fountain after you go through security. Not only are the prices of neck pillows increased at the airport, there’s no way for you to know how long the pillow has been there or how many people have touched or tried it on during their travels. Try to wait until you reach your destination to pick one up. While exchanging your money at the airport is a convenient option, it usually costs more with higher fees. If you have questions about exchanging your money, talk to your financial institution before you leave for your trip. Just like the food and beverages offered at the airport, with so little competition, souvenir shops are able to mark-up their prices. Keep a list of the people you're wanting to purchase souvenirs for and keep it with you during your shopping trips. This will help you from forgetting anyone and preventing a stop at an overpriced airport gift shop.